The following was written by Kevin Williams of The Stinger Report, covering the history of Chuck E. Cheeses which is the largest chain of Family Entertainment Centers in the world. How the redesigned Chuck will appeal to kids I have no idea, not being an expert in mascot creation but I suppose its past time for him to be 3d-ified. Those of you that saw my Atari History Timeline – then you will have seen the 1977 entry that marked Atari opening the ‘Pizza Time Theatre’ concept, originated by Nolan Bushnell and his team. This would go on to be brought out by him from Atari owners (Warner Communication) for $500,000. Later he would leave, and the debacle between ‘Showbiz Pizza Place’ and ‘Chuck E. Cheese’s’ would embroil the concept. For more of the trials and tribulations that led to the company we now see today, I would point you to Wikipedia. As can be seen the new ‘hip’ re-design of Chuck will mark a new investment by the company with an increased build of new venues, and a update of existing sites – rumors are also that there are a number of new concept venues in the wings, building on the brand. With 550+ sites who says the arcade scene is dead! 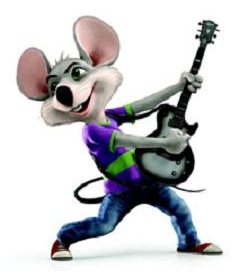 NOTE – The character Chuck was originally considered to be called Rick Rat (the chain was to be called Rick Rat’s Pizza, until the company’s PR stepped in). The Chuck character was to have appeared in his own game (Food Fight), but by then the Atari owners had split from the restaurant chain so ‘Charley Chuck’s’ took the center roll. My opinion, since I’m back, there’s always gonna be a need for CEC period. The environment is perfect for children and don’t need reinventing since they don’t need to change. Right now, the place is focus more on tickets and children age 2 to 8……maybe 9. And, they aren’t bitching about the business……..yet. Plus, its a good place for a family to have a bday party on the budget. But, this is from a Californian view point. Chuck E Cheese is a total sell out. The rat was already in show-business in the late 1970’s. 20 years later and he’s like “HEY KIDS I RIDE A SKATEBOARD I’M SO EXTREME!! !” We’re supposed to buy that? Who takes up skateboarding all of a sudden in their late 20s?! The classy Chuck was so much better.